You can view and print files from a USB thumb drive or other external storage device, such as an external hard drive. Before you connect your thumb drive or device, make sure the product is turned on but not printing. Note: Epson cannot guarantee the compatibility of your device. Make sure the files on the device are compatible with the product. Remove any memory cards from the product. Insert your USB thumb drive or the USB cable that came with your device into the USB port on the front of your product. When you see a message that the device is recognized, select OK. When you finish printing, make sure the access light on the drive is not flashing, then remove or disconnect it from the product. Do not remove the USB drive or turn off the product when the access light is flashing, or you may lose photos on the drive. 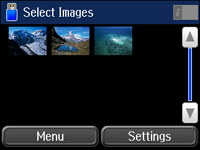 You can quickly select all of the photos on your memory card or other device for printing. Note: If you have more than 999 JPEG images on your device, the images are divided into groups, and you must first select the group you want to display. Select Settings and choose the print settings for all of your photos. Select Proceed. You see a screen confirming your print settings. When you are ready to print, press the Color button. You can select and print files in the TIFF format from a memory card or other device. Select TIFF. You see a list of the available files. Select the file you want to print. You see information about the file. To print more than one copy, use the icons on the screen or press a number key on the product's control panel. To change the print options, select Settings, and select the necessary options. When you are ready to print, press one of the buttons.